Hello, my babes. I've been going on so many lil trips this season, and right now I am in between two. The adventures in new places do wonders for the soul and refresh my perspectives. Travelling gets me out of my comfort zone and into a more reflective state. When I return home, I am always filled with gratitude for all the pleasures - small and great - in my life. One small pleasure is making myself cute, hot drinks in the morning. 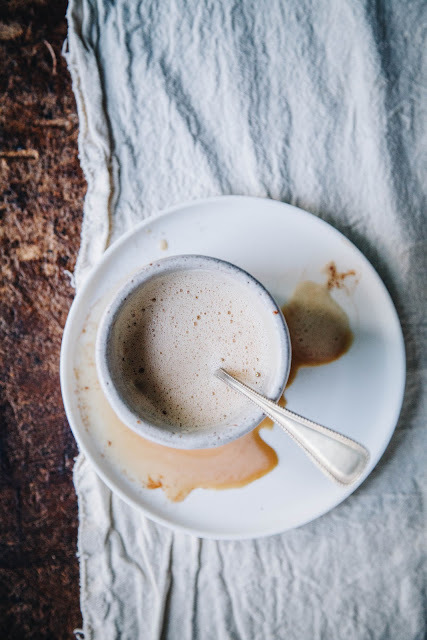 In this post, I am going to talk about minimalism for a sec, then loop back around to how it relates to this latte. I am committing increasingly to minimalism this year, passing on most of my furniture to new homes and letting go of clothes, records, books, and dishes I don't need. Through this process, I find joy in simplicity and the quality of moments instead of in a quantity of objects. I've begun washing my laundry by hand each night, and meditating on a floor cushion instead of a chair. By choosing a small number of items to keep in my space, I am able to devote more time to a mindfulness practice, self-reflection, and a deeper gratitude for the objects I keep around. (I also spend less time cleaning and tidying, and WORRYING about cleaning and tidying.) Please note that practicing minimalism is not for everyone. I can only speak from my own experience, and no one else's. I have always had access to abundant food, shelter, luxury comforts, etc. and so letting go of some of those luxuries is fine with me, because it is indeed a consensual choice. We are all coming from different places and there a million reasons I can totally understand for which someone would not be into minimalism at all. Do you! Now that I only keep and use a few mugs, they each feel special to me, and there is an honour in drinking from and cleaning them. I feel more sustained with less objects, instead of overwhelmed by more than I could keep track of in my mind. So, my morning routine becomes a gratitude practice! 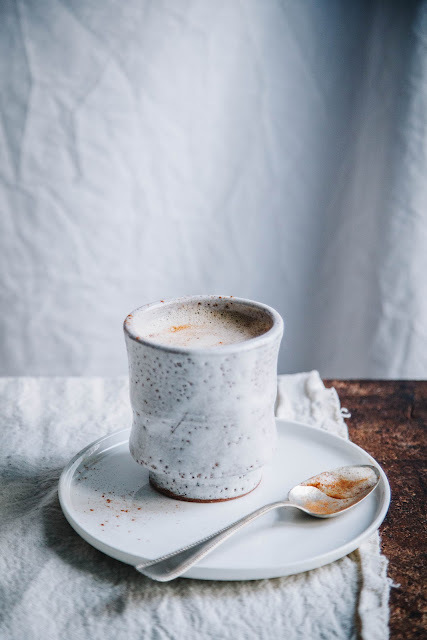 The whole process of making a hot beverage for myself seems almost sacred, especially when I sit down on my meditation cushion and mindfully take in each sip and sensation. I love doing this with matcha tea, and caffeine-free lattes. 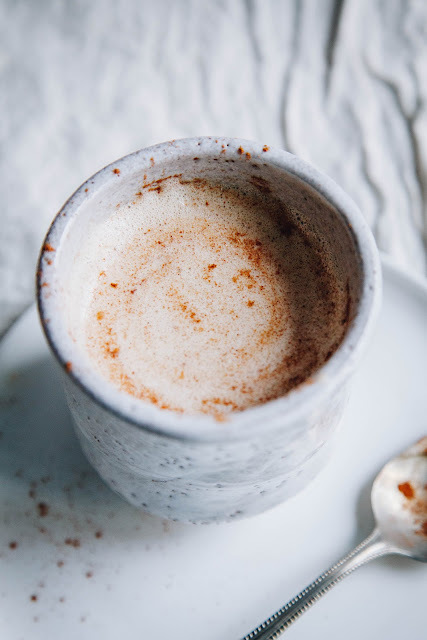 Today I will share a latte recipe I make many times a week, and enjoy any time of day. The recipe is rich, creamy, and just sweet enough. Dandy Blend is the ingredient which gives this drink its coffee flavour, sans coffee. I'm not being paid by Dandy Blend in any capacity; they don't even know I am writing this post. I simply have never discovered another product that creates such a robust and delicious coffee alternative. The ingredients in Dandy Blend include roasted chicory root, barley and dandelion. I love pairing it with full fat coconut milk, vanilla and maple syrup for a creamy latte experience. That's what I have done with this recipe. Enjoy, darlings! Serves 1. Print the recipe! 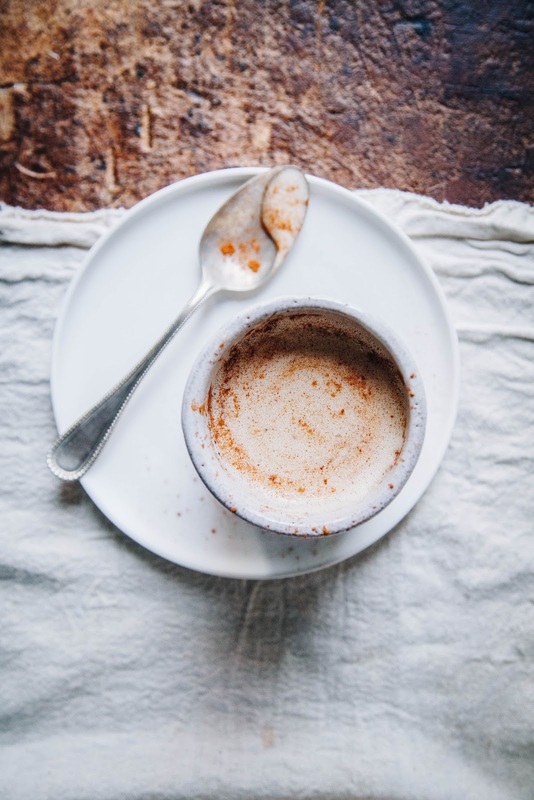 Blend or whisk all ingredients together until smooth and frothy. Adjust according to taste; feel free to add more Dandy Blend, vanilla, maple syrup, coconut milk, etc. Enjooooy.